One of the most common challenges our customers face is figuring out how to deal with asbestos flooring. When not handled properly, the consequences are not only costly, but can also be dangerous. While there are many possible solutions, not all are right for each project, so we’ll outline the pros and cons of various solutions to help you decide which is best for your situation. But, before diving into the possible solutions, it’s first important to understand what asbestos is, the challenges contractors face these days with asbestos flooring, and the difference between abatement and encapsulation. To counteract the dangers of asbestos, you must understand exactly what it is. Contrary to popular belief, asbestos is not man-made. In fact, it’s a naturally occurring mineral. Asbestos forms in the environment as bundles of fibers with properties that include the ability to resist fire, chemicals, and electricity. Because of this, it was once commonly used in industries including construction, shipbuilding, textiles, and flooring. When asbestos flooring is disturbed, the fibers release into the air. When the fibers are inhaled, they can get trapped in people’s lungs, causing scarring and/or inflammation. Not only can this cause difficulty breathing, but also can lead to longer term, serious health issues. Asbestos is also classified as a dangerous air pollutant, affecting air quality and the ozone layer. Because of these risks, many products that contain asbestos are now banned. Now that the health and environmental risks are known, the Environmental Protection Agency (EPA) has put forth a series of laws to regulate the use of asbestos. Regulations range from The Asbestos Hazard Emergency Response Act (AHERA), which requires educational agencies to inspect schools for asbestos-containing materials, to the Asbestos National Emission Standards for Hazardous Air Pollutants (NESHAP), which specifies best practices when renovating or taking down a building with asbestos. Today, the EPA has determined that there are two ways to safely deal with asbestos flooring - removal (abatement) and repair (encapsulation). Abatement is often defined as the complete removal of all asbestos from a building. This option is selected because it typically leads to complete elimination of asbestos, removing health and environmental risks. Also, once the asbestos has been removed, the building can often be repurposed. But, there are some negative aspects of abatement to consider. First, asbestos is very costly to remove, typically costing $25 per square foot. It also requires filing permits and finding trained professionals to remove the flooring. Total abatement can take a long time, and the entire area is unusable while undergoing asbestos removal. The additional costs and time associated with removing asbestos flooring lead many contractors to search for another solution. Encapsulation is another possible solution. There are two main types of encapsulation that both involve sealing off the asbestos flooring with a product to prevent the release of fibers. The first type of encapsulation is conducted with a ‘penetrating encapsulant’, which seeps into the floor and glues the fibers together. For example, some types of artificial and hardwood flooring were once fabricated with asbestos fibers. In this case, you might pour a penetrating encapsulant, like a liquid plastic or liquid adhesive, over the floor. The floor then ultimately would absorb the penetrating encapsulant, theoretically sealing in the asbestos. The second type of encapsulation is conducted with “a bridging encapsulant”, which covers the asbestos containing material, preventing the release of fibers. Examples of a bridging encapsulant include a plastic membrane or carpet. There are several reasons why encapsulation might be a good solution for your asbestos flooring predicament. First, encapsulation usually costs much less than abatement. It also requires less time, especially when using a bridging encapsulant in conjunction with a dry adhesive system, like Lok-Lift®, that doesn’t require any curing time (unlike glue). This is also the ideal solution if you need a quick turnaround for the project. Further, asbestos fibers are minimally disturbed during the encapsulation process, decreasing the risk to workers and future building inhabitants. Once the asbestos is contained properly, the environment is typically safe. Sometimes, however, encapsulation isn’t an option depending on the amount of damage asbestos has caused to the flooring. Also, consider that as long as the asbestos is still in the building, it will likely need to be removed if the building is demolished down the road. 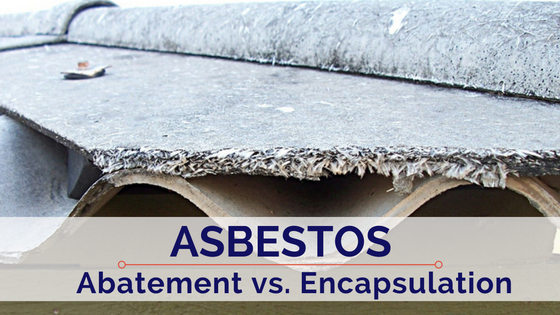 The choice between abatement and encapsulation of your asbestos flooring will vary from person to person depending on individual circumstances. If you have a larger budget and are unfazed by the downtime required by abatement, complete removal may be your best option. If you need a lower cost option or are on a shorter timeline, encapsulation might be a better fit for your situation. There is a third option, too. If an expert determines that your asbestos flooring is in good shape and undamaged, then you could simply leave the asbestos alone and keep a close eye on the condition of the floor, keeping in mind that you will need to consider abatement or encapsulation down the road. Make sure to consider the health and safety aspects, as well as the time and money required, to choose the selection that makes the most sense for your asbestos flooring. If you do decide that encapsulation will offer the best solution for your project, and you need a non-toxic dry adhesive to help hold down the flooring you plan to install, we do manufacture a product for this called Lok-Lift®. Lok-Lift is by no means the only option and may not be the right fit for you. But we would be happy to explore whether it’s a fit or not at any time. Contact a Lok-Lift specialist if you would like to learn more.